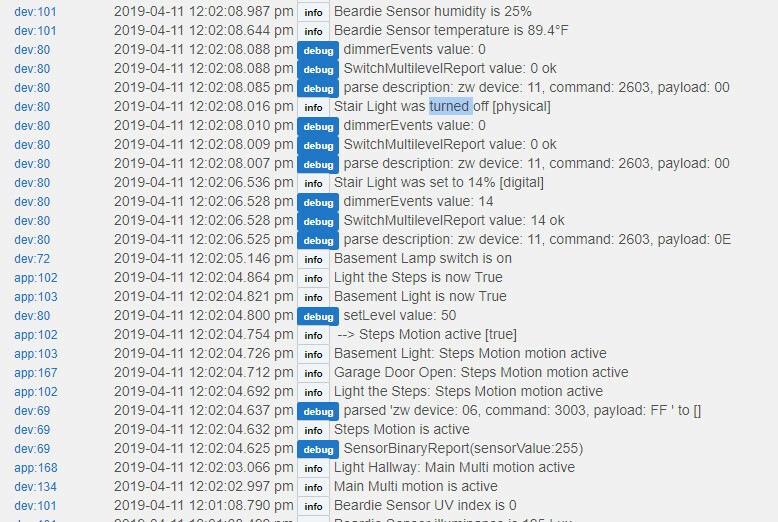 I have a system where when motion is detected on the steps it turns on lights going down the steps. It was working great and then started taking a long time to come on (delayed) and then I noticed that the dimmer level was set to something abnormal. I just cannot figure out what went wrong all of the sudden. I captured some logs that show something setting the dim level to 14. I only ever set it to 50 so I'm not sure where that's coming from. Can someone look at the attached screenshot and tell me what they think is going on? I'm not really sure what I'm looking at. You can see steps motion detected at 12:02:04:632. The Z-Wave bulb is dev 80. I see it said it was set digitally to 14, but who set it. I also see where it said it was turned off physically. That wall switch was never touched. Very strange!!! When I got home tonight I took another look. Now I'm seeing an error. Device 80 is a GoControl Z-Wave bulb. What driver is selected for the device? Are you setting this with a Rule or another app? It's the generic z-wave dimmer. RM is what's driving it. I tried the smart dimmer, but that did no better. I just changed the rule to just turn it on instead of dimming it to 40, and there was still a significant delay. Check out the trace below. As you can see almost a 5 second delay after Light the steps is true. Doesn't make any sense. I don't see that bulb on the list of supported devices. From what i can see, it is a Z-wave Plus device, so you would definitely not use the generic z-wave dimmer. The smart dimmer is for z-wave plus devices but I don't know how it would work with a bulb. You say this was working fine for a while but just stopped? The stair light turning off physical is interesting because by definition you can't turn a bulb off physically, it has no switch. so something strange is going on. Sorry I couldn't be more help. Hopefully someone else will know more.